This past week I had the opportunity to attend an open house at my kid’s elementary school. I am not sure how many of you have elementary age kids but I have 2 lovely kids that age (and 1 in middle school). Every time I visit their classrooms I notice all the visuals. They use visuals throughout their learning process. Whether it is learning the alphabet, weather, time, dates, reading or whatever else the topic it is visual. Elementary classrooms are run very much like or Lean factories with regard to visuals and organization. The use of labels help the kids learn new words but also keep the classroom organized. Everything in a classroom has a home and everything is in its place. All the children know this very well. On this recent trip I was reminded of the importance of establishing standard work. If you want people to behave in a certain way or do something in a particular manner than you need to use standard work. Here is an example of standard work at my daughters 3rd grade class. It is mounted on their desk in the top right corner clearly visible. 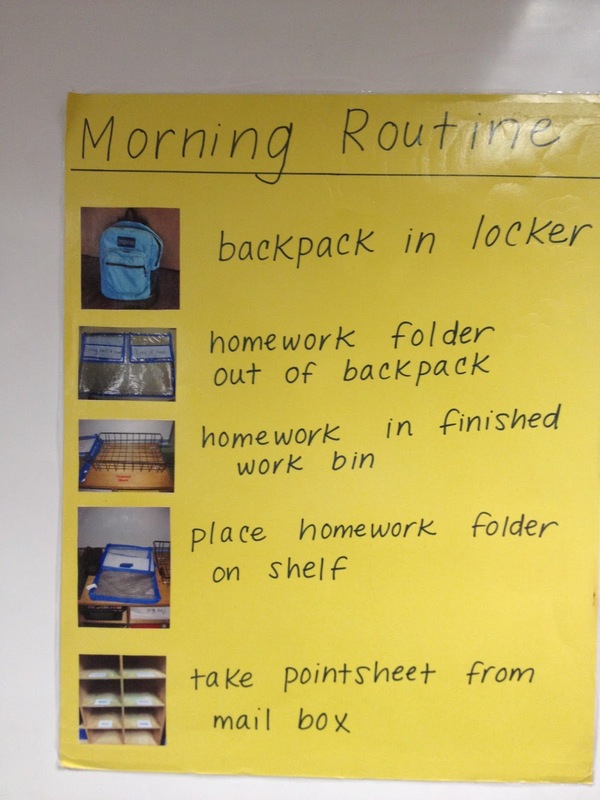 The kids don’t have to remember all the steps in the morning routine because it is right in front of them. It gets the kids organized and ready to start learning without wasting any time. Standard work is highly effective at establishing a means to do something that everyone can follow. It also makes it easy to identify when someone is not following the process. Standardized work is one of the most powerful but least used lean tools. I can't but think if a school teacher can use this technique to establish a morning routine for their students why so many managers feel weird doing so for their employees. Perhaps we have forgotten what we learned. This is why I feel this example of quality improvement in an unexpected classroom is worth sharing.